Download the patterned sheet and cut the boudary section away. 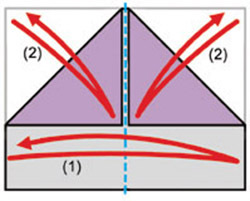 With patterned side down, (1)fold paper in half and unfold. 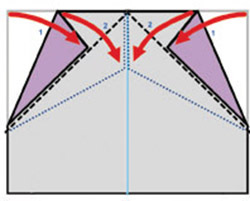 (2)Bring the top corners to the center crease and unfold. 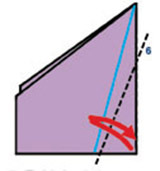 Fold both corners along line 1 and fold over along line 2. 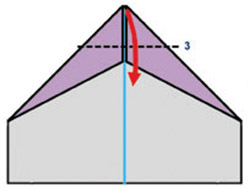 Fold the tip down along line 3. 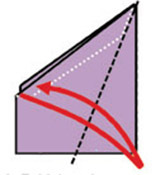 Fold the sloping edges along line 5. Tape as shown. Then fold paper in half. 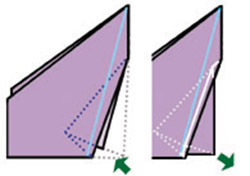 Fold the top side wing along blue line. Then unfold. Turn over the paper and repeat for other side wing. Then turn over again. Fold the line 6 and unfold. (It is top side of the fuselage. Fold the line 7 and 8 and unfold as we did in the previous step. 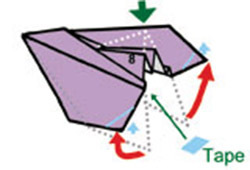 Push the corner into the fuselage and collapse it inside between layers. Then pull out the corner using an inside reverse fold along line 7. This part will be tail fin section. 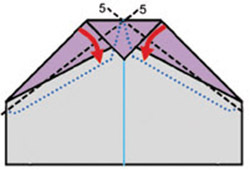 Push down the tail fin using mountain fold along line 8. 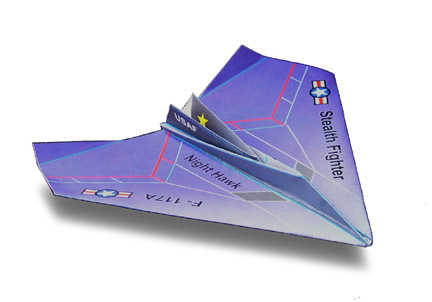 Bring both wings up and bend up the trailing edge. 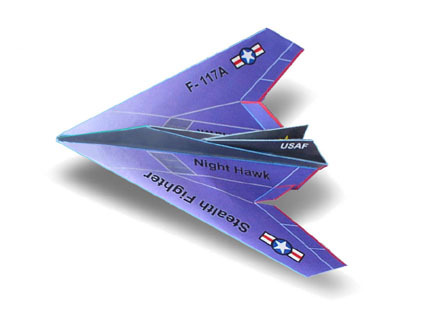 Optional: You may cut red lines so that the plane looks like the real F-117A. 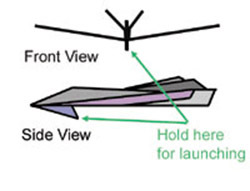 Use a tape to hold fuselage. 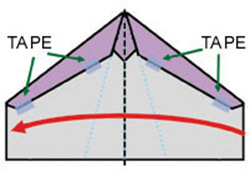 Bring out a small triangle part from the fuselage head. You can hold this part for launching the paperplane. Adjust the creases until the model has this front and side profiles. Note that the angle of the wings is upward! Bend the trailing edge little bit upward for better flight!